I’m returning to the Oiniades Theatre Festival as a guest composer, this time for a modern adaptation of Aeschylus’ Agamemnon. As before, Dennis Christilles (a professor of theatre at KU) is creating the adaptation and directing the play, and I am composing music for the choruses and interludes. I’ve written some of the music already, but will write the rest in Greece. I love this Greek experience because it is truly unique. The vocal abilities of the actors, plus the instruments involved, vary each time, and somehow I have to create a musical score that works with the forces we have available. It is truly a show custom-created for the ensemble. Last time we produced The Bacchae by Euripides. This time it is Agamemnon. Unlike last year, I will not be playing an acting role – only a musical one. So what’s the premise of the show? In a nutshell, Agamemnon has been gone for ten years, laying siege to Troy in order to capture and bring back Helen. At the beginning of the play, a watchman notices that signal fires have been lit, signaling the fall of Troy. A herald eventually arrives, bringing news that Troy has been destroyed and that Agamemnon and his surviving forces should return home soon. One would expect this to be good news, especially to Clytemnestra (Agamemnon’s wife), but one must remember that she has been at home brooding for ten years. Not only did her husband abandon her for a decade in a “rescue” effort that sapped Greece of its resources, he also sacrificed their daughter Iphigenia in order to receive favorable winds for their passage to Troy. To make matters worse, Agamemnon returns with a pretty Trojan prophetess as his concubine (Cassandra). To put it lightly, Clytemnestra is just a bit “peeved”. Clytemnestra welcomes Agamemnon home, insisting that he walk on a red carpet into the palace. Agamemnon is hesitant not to seem prideful or arrogant, but eventually concedes. He goes into the palace and is murdered in the bath by Clytemnestra. Cassandra prophecies about her own death to the unbelieving chorus, then walks into the palace and is also slain by the raging Clytemnestra. The play ends with Clytemnestra attempting to justify her actions while Aegisthus delivers a boastful speech that nearly ends in a brawl. Clytemnestra chastises him, stating that there has already been enough blood spilled today. The chorus then drops a foreboding hint that Orestes (the son of Agamemnon and Clytemnestra) will surely return in order to seek vengeance for his father’s murder. Yes, Agamemnon is the first in a trilogy of plays about the cursed House of Atreus. If you want to read further, start with an overiew of the Oresteia. 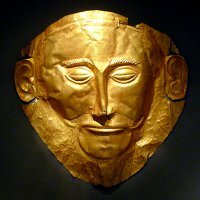 I leave you (for now) with this, the supposed “death mask” of Agamemnon, which is on display in a museum in Athens. I have limited internet access in the village of Katohi at Oiniades, but will create at least one new post and upload some pictures in July. Until then, my best wishes to all of you.